Have a good catch today? 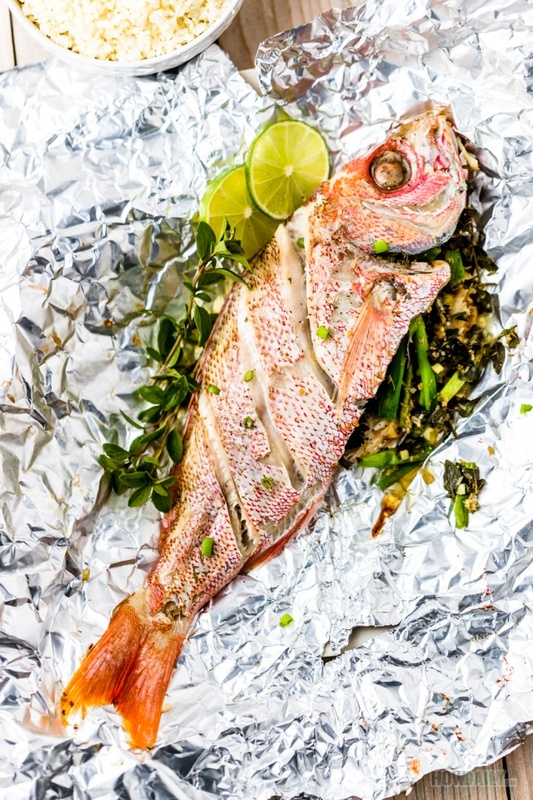 Try this easy foil-wrapped oven baked whole red snapper to light up your appetite. This dish is so easy to do. All you need are the ingredients, rub and stuff them. 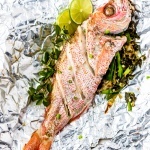 The fish is then wrapped with foil carefully and can be baked in oven or roast on the grill. If you have a large party, just wrap them singly and grill/bake just like you would with the foil-wrapped potato. Sound easy enough right? Just a note right after washing, by dabbing and soaking in white wine – ginger solution for as little as 5 minutes, the fishy smell will be removed. 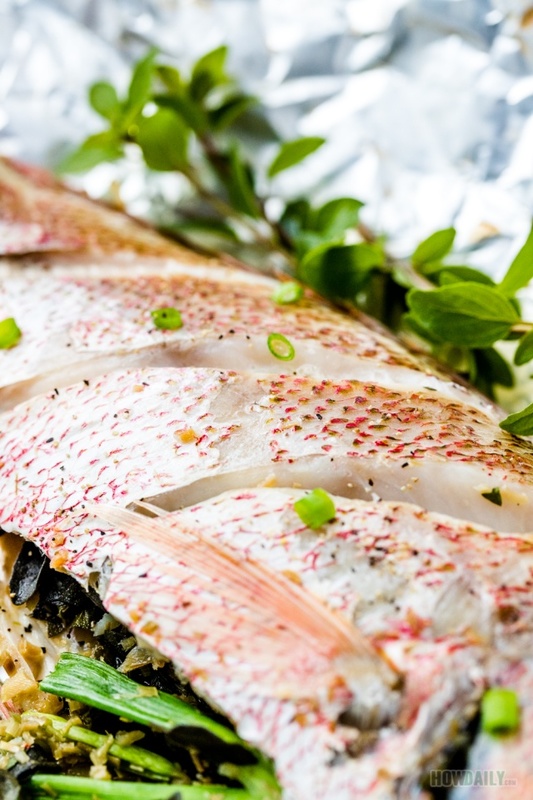 This leaves only juicy fish with light salty umami. Eat this alone or with some special sides and dipping like the Vietnamese fish sauce to variate the flavor. Mix 2 Tbsp of white wine with 1/2 Tbsp minced ginger. Soaked and dab this solution all over the outside of the fish. After 5 minutes, light rinse and dry with a paper towel. Rub sea salt all over the fish. Chop lemongrass, thyme/lime leaves and scallion into 1-2 inches chunks. Mix these with remaining ginger. Stuff the above seasoning herb into fish belly. Have large enough piece of foil on flat surface, oil spray or spread evenly. 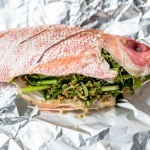 Place the stuffed red snapper onto foil and wrap it with this foil. Preheat oven to 400 F, and bake red snapper for about 25-30 minutes.